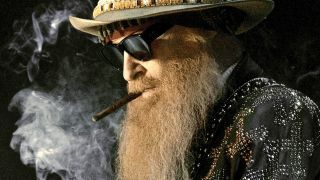 ZZ Top’s Billy Gibbons has announced that he’ll release a new solo album later this year. The collection of original tracks and classic covers is titled The Big Bad Blues and it’ll arrive on September 21 via Snakefarm Records. And to mark the announcement, Gibbons has shared a lyric video for the lead single – a cover of Muddy Waters’ Rollin’ And Tumblin’ which can be watched below. The follow-up to 2015’s Perfectamundo was co-produced by Gibbons and Joe Hardy and recorded at Houston’s Foam Box Recordings. Gibbons says: “We successfully made our way through those uncharted waters with the Cubano flavour of Perfectamundo and completed the journey. The album features a total of 11 tracks with vocalist and guitarist Gibbons joined by Hardy on bass, Matt Sorum and Greg Morrow on drums, Mike ‘The Drifter’ Flanigin on keyboards, while James Harmon contributes harmonica to the record. Gibbons is expected to announce a run of tour dates in support of the album in the near future. The Big Bad Blues is now available for pre-order. Find out further details below.